Thousands turned out to take a trip ‘doon the watter’ to mark Paisley’s radical weavers at the annual Sma’ Shot Day and Weave Festival celebrations at the weekend! The event attracted more than 12,000 people to the town to enjoy a diverse range of cultural performances and events including one of the world’s oldest workers’ festivals – Sma’ Shot Day. This year’s theme marked the weavers’ annual holiday where they would traditionally go on a trip to the coast and it proved to be particularly apt as the sun shone on Paisley giving a real holiday atmosphere. Paisley’s radical history began as a result of the famous dispute between the local shawl weavers and manufacturers in the 19th century. The sma’ shot was a fine weft yarn, woven into Paisley shawls by the weavers, which they were not paid for. An agreement was finally reached to pay for the sma’ shot in 1856. More than 450 costumed performers, artists, community groups and families took part in the Sma’ Shot parade led by the Charleston Drum – the traditional way of calling out the weavers for the annual festival. This year's parade, programmed by Bridgeman Arts, had the added spectacle of an 18-metre steam boat float to signify the weavers’ annual holiday where they would traditionally take a trip ‘doon the watter’. 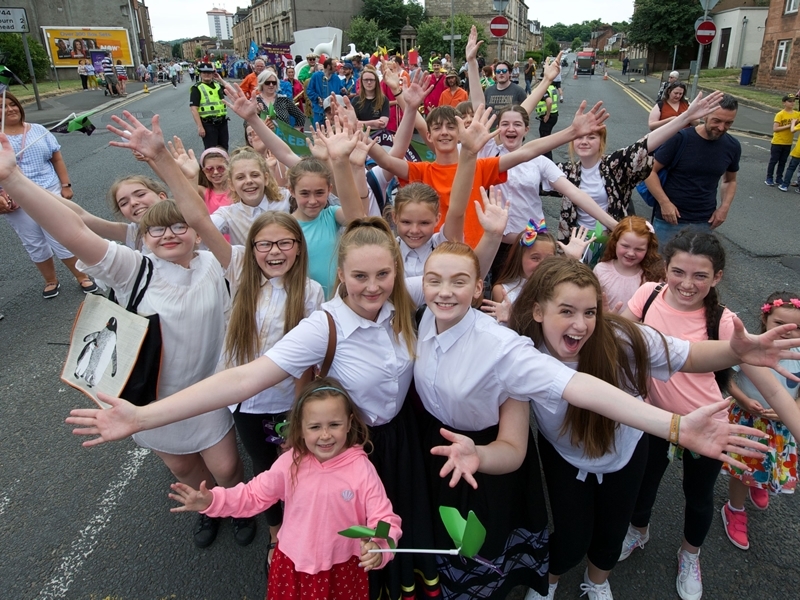 Renfrewshire’s Provost, Lorraine Cameron, said: “The Sma’ Shot Day parade is a firm favourite in the calendar each year and it was great to see so many local community groups take part and entertain the crowds. As part of the day’s events a Youth Poetry Slam took place at the Dooslan Stane stage where a number of young people shared their experiences through spoken word performances – carrying on the town’s rich heritage of activism. This element of the day was tied into the wider Year of Young People 2018 programme which aims to give young people a stronger voice on issues which affect their lives, showcase their ideas and talents, and ultimately, create a more positive perception of them in society. The fun-packed afternoon featured around 30 shows in Paisley’s historic town centre with highlights including a seaside experience where families could relax in the sand, weaving demonstrations and a poetry slam, storytelling sessions, and a series of talks, workshops and demonstrations from local artists and designers!